Semrock employees speak a total of 12 different languages? Wavelengths has been created to provide people interested in fluorescence imaging with useful information and tips on how to be more productive and produce better images. In addition to our own articles we will provide links to other sites we believe will be of interest, upcoming courses, a forum for asking specific questions involving filters, white papers and technical notes. Most importantly, we would like this newsletter to be a collaborative project with the microscope community at large. We invite and encourage you to send us your ideas, tips, questions, ideas for improving the newsletter and anything else you think we should know. When we look at a fluorescence imaging system the choices of light sources, objectives and cameras are given a great deal of attention, and rightly so – they are critical components and can be very expensive. 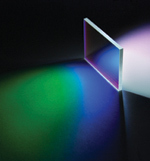 Fluorescence filters, on the other hand, are often taken somewhat for granted if their specifications approximately match up with excitation and emission spectra of the fluorophore being observed. The fact is, filters bring a lot more to the party than simply filtering light. Tips and Techniques - Should You Keep Your Filters Clean? Intuitively, you know to avoid using dirty filters. We evaluated the effects of having a dirty filter in a fluorescence microscope to determine what, if any, effect they really have on your images. Watt Webb Speaks. And We Listen. Our own Neil Anderson, PhD, talks to Watt Webb, co-inventor of multiphoton imaging, at Cornell Univesity. Read what makes Dr. Webb tick. Q: Can I angle-tune my filter? A: The short answer is yes. All thin-film interference filters may be angle-tuned by purposely tilting the filter in order to change the angle at which light is incident on the filter. This change in angle causes the spectral response of the filter to shift toward shorter wavelengths as the angle of incidence increases. For further information on angle tuning, refer to our technical note Filter Spectra at Non-normal Angles of Incidence. - Turan Erdogan, Ph.D., CTO Semrock, Inc.
Great microscope images and audio of a wide variety of biological subjects. Good for all ages. Interesting flash explanation of the flow cytometry process. Just Released - Five band dichroic for multiband imaging. Our beefiest Sedat set to date. New Multiband Imaging Sedat Set. A list of worthwhile microscopy Summer Courses around the US, Canada and Europe.